I haven't been around here much lately. I'm back in that slump I was in a few months ago, but it has nothing to do with my adoption. Well, maybe it does, indirectly. I just feel so...'blah,' for lack of a better term. It fits perfectly. As I've said before, I'm not happy with my weight gain or my weight in general, and I haven't been for a while now. Honestly, I don't even know what I weigh, but I know it's too much. It really hit me the other morning when I was frantically looking for an outfit to wear to work (I hate not having my clothes ready the night before!). I found a pair of black dress pants, and thought I had hit the jackpot and would be out the door as soon as they were on. Well, no such luck. They were my old work pants, from the job I had in 2009, until I was laid off in December - about a month or so before I got pregnant. They were practically half the size of the pants I'm in now. Maybe not half, but damn near half. I immediately felt depressed and my day was heading in a very bad direction. Let me say this - I know you gain weight when you have a baby. It's unhealthy not to gain weight when you have a baby. But you're supposed to lose it. I did lose it when I had my gallbladder out. I was almost back to my 'normal' weight (which, mind you, was still overweight, but I'm not built to be stick thin. I was wearing anywhere from a size 10 to a size 14, depending on the brand, before I got pregnant. I look back on those times and remember feeling like I was so overweight. I wanted to be a size 4, because magazines told me that's what beautiful was. Now, I would give my left arm to be a size 12 again. And to think, it was only a mere two and a half years ago). 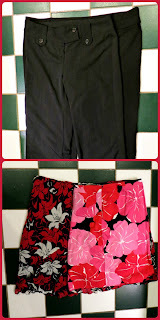 See below: my old pants (2009/early 2010) on top of my new pants, and my old favorite skirt on top of my current one. I want these pictures to be flipped - I want the ones on top to be the ones that fit, in due time. Two months or so after she was born, I was feeling pretty confident about it. I want to say I was wearing a size 14 to 16, which to some is "plus size," but to me, was right around where I had always been from high school on. At my highest weight during my pregnancy, I was about 235 lbs. Before I got pregnant, I think I was somewhere around 180. Not thin by any means, but not morbidly obese, either. I was back around there (maybe 190 or so) until June, when I got my IUD put in. It was all downhill (or, according to the scale, uphill) from there. I don't blame it fully on the IUD, because I know I was (and still am) an emotional eater and I can finally admit the fact that I was severely depressed. I wasn't even sleeping. After I got it removed this past April, I lost about 10 lbs...and then completely plateaued. Admittedly, I haven't been doing much to change it, other than cutting out Mountain Dew (I've been "clean" since 12/26!) and drinking at least 7 glasses of water a day. It's easy to do at work, because there's a little water fountain right by my desk and I don't drink coffee or anything. I've talked about this before on my blog and said I was going to get my bum in gear, but now I'm really, really motivated. I'm not happy with myself, and it's affecting everything, not just the size of my pants. I need and want to be someone my daughter can be proud of one day...I want to be someone who truly deserves to be in her life when the time comes, not someone who's there because we're blood related and I'm 'defaulted' into being part of her life. That's not what she deserves by any stretch. I need to be happy, confident, and successful before I can be around her. I don't think being over weight makes someone not worthy enough to be loved. People have to accept you for what you are. I am not saying that you should accept life being overweight just do it for you. Don't ever think your not worthy of being loved cause of extra weight. I started using a website called myfitnesspal that another blogger talked about and its helped m lose 20 lbs. You're completely right, I just am not happy with myself nor do I feel like someone she could be proud of due to the mental state I'm in because I'm so unhappy with my 'new body.' I don't mean to sound shallow (which I think I did) I just feel like it's affecting me in so many other ways. But thank you for your comment, it made me smile! Yes. I lost 20 lbs in about three months so it's been coming off slowly which is the best way. I been doing Zumba and that is tons of fun. I didn't think you were being shallow but I know for me adoption loss has kind of beat my self esteem down and at times I felt like something must have been wrong with me ect... I just don't want to see you going thru years of having low self esteem I am glad that I made you smile!